If you want your blog to be successful you have to find a niche. Especially nowadays when the market is so competitive. I think in the entire process of setting up a blog, this really is the hardest part! We as individuals have lots of things we enjoyed and different likes. It’s only normal that, as the blog is a reflection of you, you want to put that all in. But you have to have a unique selling point that will summarise your blog in a nutshell. Work out what is most important to you and what makes you special! It doesn’t mean that you aren’t allowed to write about other things, it just means that you are branding yourself and making it easy for readers and companies to understand who you are and where you fit. I think my blogging journey was pretty similar to most. I wrote dozens of blogs, read them all back a year later and full of cringe deleted them all. My blogging was HORRIFIC. I could see the influence of all my favourite bloggers without defining my own style. Like any skill, blogging takes time to develop and get good. It’s really important that you find your own voice (blogs are brilliant because they are personal after all) and the only way to do this is to write, write and write. So don’t waste any time getting started. My biggest pet hate in life is people who travel with guitars who then force their horrific renditions of Wonderwall on the rest of us while we sit in the common room of a hostel trying to enjoy our books. My second biggest pet hate in life is free blog sites. They are hideous! I literally find it impossible to read anything on these websites or to trust what is being said. I get that they are free and easy to set up. But if you want to take blogging seriously (as in if you want a following and opportunities beyond just your family reading) you must get a domain name and a proper website. Get it looking good from the start. Inject your style and get creative. While we are on the topic spend a decent amount of time getting your website organised. You want it as easy to navigate as possible so people can find content with ease. 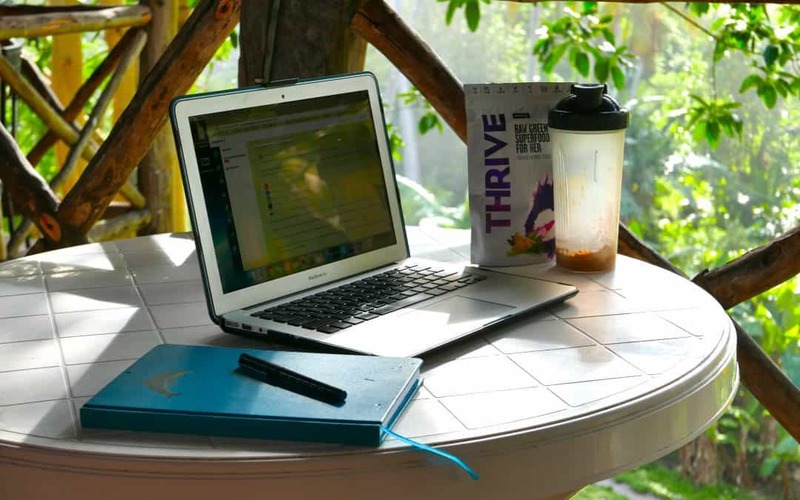 There are loads of benefits to be gained from joining blogger communities. Reading other peoples work is a great source of inspiration. If you support other bloggers (with comments, likes and shares) then you will get supported in return. It is also a good place to be introduced to brands or to hear about opportunities if you are interested in moving into sponsored posts. For outdoor and adventure bloggers I can recommend checking out the Outdoor Bloggers group as a start. If you are doing any form of travel writing than Travel Blog Success is also a great community. You have to pay to join which also includes courses (I don’t rate them so much) but the online community has been really helpful. Blogs are more than just writing. There are lots of bloggers that put a huge amount of emphasis on taking incredible photos (like Alice in Wanderland, the Girl Outdoors and Bridges and Balloons). Photography doesn’t interest me enough to put this level of effort in (plus I don’t have a photographer boyfriend which seems to be the common theme!). But I do know how to take half decent photos. It makes all the difference! My photos are taken on with my iPhone or my compact camera (Lumix LX100 – which is also amazing for taking video, I really love it!). I understand the basics of photo composition and put a lot of emphasis on the pictures being bright. If there’s a choice of using a bad photo or none at all, I’d go without (unless the picture is showing something that might be genuinely helpful to the reader). Get yourself some business cards with your blog name on. Start handing them out to people you meet and asking them to check out your blog. This is a great way to build a following early on. You might feel a little embarrassed but you shouldn’t. You should learn to feel proud of your blog…..this is an important step to get over because that embarrassment will show in your work. SEO (Search Engine Optimisation) is basically a game that you need to play so that search engines will recognise you as a useful site. If you get this right, it means that your relevant blogs will appear high up when people search. Organic searches make up about 70-80% of my traffic….the rest coming from links on social media, forums or people going directly to my website. Before working out if SEO is good on a blog you have written, you first need to find a keyword. This is a group of words that someone might use to search a particular subject. 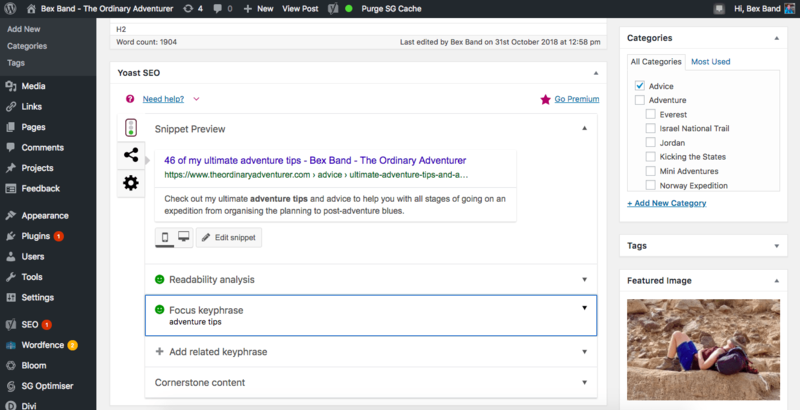 Head to keyword planner and type in some possible phrases people might use if they wanted to find the blog you have written. I usually write my blogs first based on advice or stories I’ve got to tell. I then look for the keyword afterwards and find a way for it to fit naturally into what I’ve written. A lot of people do it the other way round and find a keyword to write a blog about. I find this a lot more contrived and I think it can show in your writing. So you’ve got your keyword….how do you now get that into your blog so it ranks highly on SEO? You then need to click on the drop-down box. 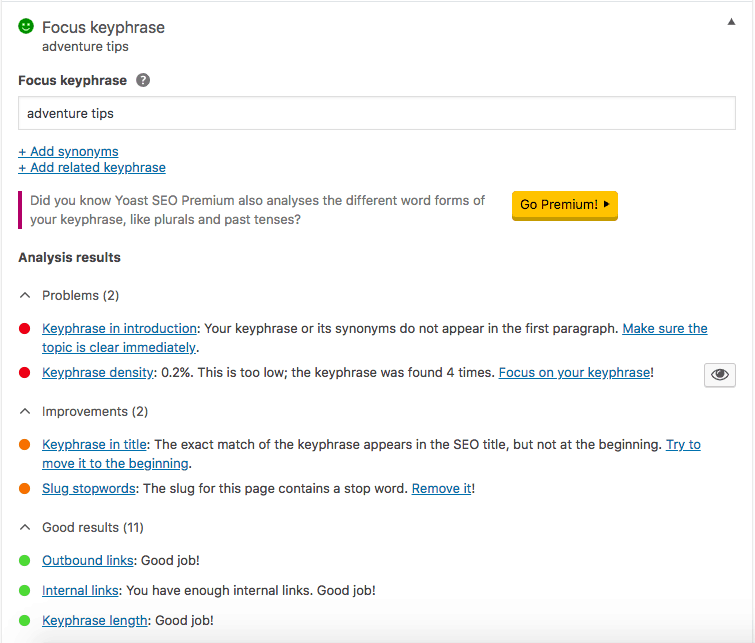 Below is an example of the ‘focus keyword’ box. On this post ‘adventure tips’ was my Keyword so I have put that in. The tick box below shows all the different ways you can follow SEO to make sure your blog will be found in searches using this keyword. This should be self-explanatory – green is good, amber is ok but could be better and red is not good. It’s hard to get them all green but try to get most of them. It can be as simple as adding the keyword to the description of a photo you’ve included, or in the title of your blog post. This really is a very simplified version of SEO but if you can follow the above suggestions it will make a huge difference. When I started using good SEO, my blog posts went from having a handful of readers to hundreds and then thousands. It’s boring and can feel contrived but it is just the game you have to play. All art forms have constraints in which they need to work. I’ve seen so many good bloggers who don’t get any growth or visitors because they can’t be bothered to spend the day or 2 it takes to familiarise yourself with SEO. If you want to reach people there is no way around this! Following the post about sticking to the rules and playing a game to get more traffic…..I also want to add the importance of being genuinely useful. You have probably read blogs ‘top 10 things to do in Paris’ which have clearly just copied and pasted the top 10 on trip advisor with stock pictures and no genuine insight or useful details like costs or why it’s worth visiting. On pages like this, you click, scroll for a few seconds and then never visit again. Writing genuinely useful and insightful content will encourage people to then become regular followers and to see what other blogs you have on your sight. This helps your stats and also helps you with SEO as search engines recognise you as a popular and useful site if people are choosing to stay. I often repeat the importance of collecting emails from your readers early on with a subscribe button. These are your most loyal followers and having direct access to their inbox is a great way for you to stay in touch, share what you have been doing, what blogs you’ve been writing. I use MailChimp and try to send out an update every 4-6 weeks or so. Make sure your site is set up with Google Analytics. This means you can access lots of important information on who is visiting your site, when and where they are going to. Although it can be a bit tedious looking at this (with the exception of seeing traffic to your site each day which is quite addictive!) it provides you with really valuable information. You are able to see what your most popular blogs are. Where people are heading on your site after finishing reading the blog and how they got there in the first place (i.e. via Facebook or a search engine). Once you’ve got this information you can then start repeating what is working. Seeing what is attractive to readers and how you can provide more of it. Great, so you’ve written a killer blog. It’s got great pictures, a catchy title and the perfect keyword/SEO combo. Once you click ‘publish’ your job is not yet done. To drive that initial traffic to your page you are going to need to get your blog out there in the world. This is why having a good social media following really helps (more tips on that here). Here are some ideas of how you can share your blog…. Contact any companies or people who might be interested in reading or sharing your blog. Did you make any recommendations on your blog? Let them know! The more creative you can get with sharing your blog, the more it will be read. The more it is read, the higher up it will appear in search engines and the more followers you will get. This is an important step not to be missed! Really I could go on forever about blogging. But this list covers the basics that I think you need to know. If you follow all these steps consistently you will really start to see big changes in your traffic. If you found this helpful please do take a minute to follow me on Facebook, Twitter and Instagram. And if you find my content and creations of value, you can support me on Patreon. Any questions at all…..just ask in the comments box below!